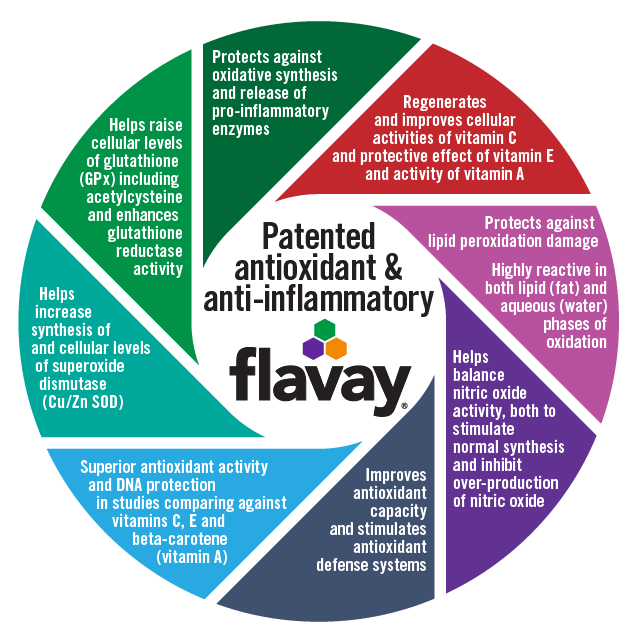 Flavay's® strong antioxidant power is patented as a scavenger of the free radicals that play a major role in the degradation of collagen and initiation, duration and breakdown of inflammation. This means that your blood flows better and your joints hurt less. 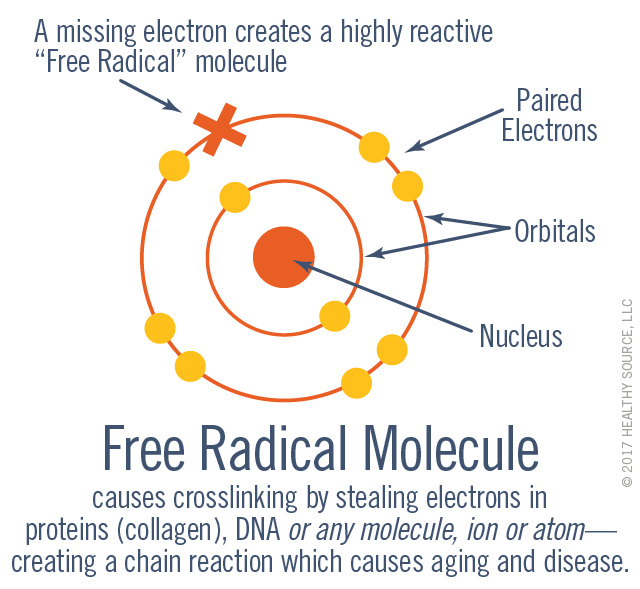 "Free radical" molecules constantly work to break down all living cells. 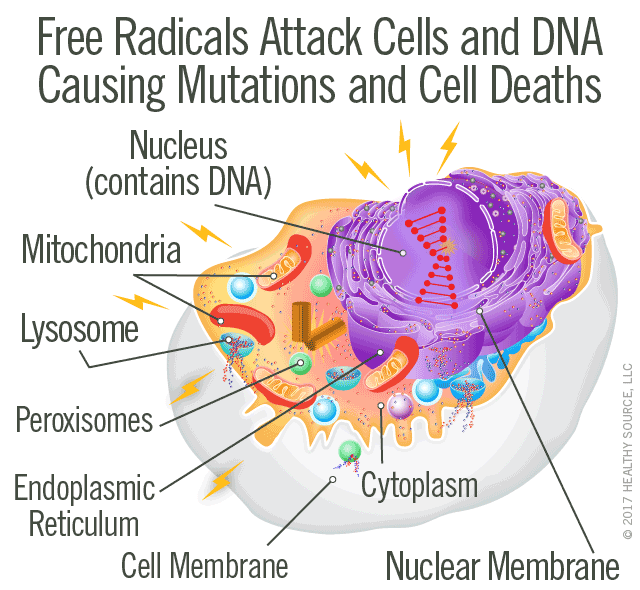 Every day about 10,000 free radicals attack each cell in our body—and they damage anything and everything in the human cell. The type of damage depends on which part of the cell is injured, as discussed below. Mitochondria: Damage to mitochondria depletes the cell's energy supply. Common symptoms include fatigue, muscle weakness, peripheral neuropathy. Lysosomes: When lysosomes are injured, the cell can no longer detoxify itself properly. Enzymes leak out of lysosomes and digest the cell, resulting in inflammation and necrosis (death of the cell). Peroxisomes: Similarly, when peroxisomes are injured, the cell can no longer detoxify itself properly. Like miniature sewage treatment plants, peroxisomes neutralize harmful toxins and carry out lipid metabolism and oxidation reactions that break down fatty acids and amino acids. (Liver cells contain large amounts of peroxisomes.) Damage to peroxisomes is linked to liver dysfunction and neurological dysfunction and degeneration. 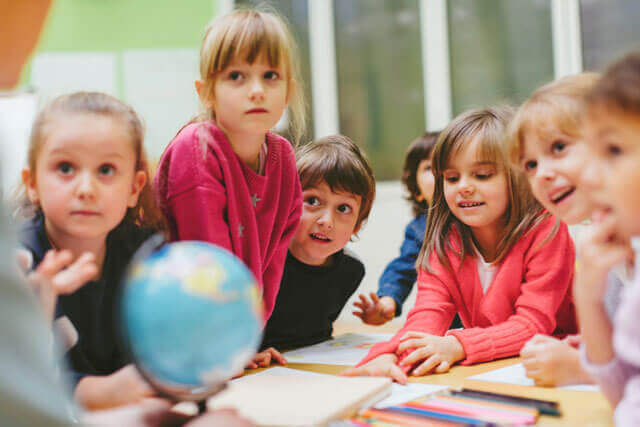 Endoplasmic Reticulum: Damage to the endoplasmic reticulum is linked to a higher susceptibility for inflammatory processes and cognitive impairment. Cell Membrane: Injury to the cell membrane impairs nutrient delivery and waste removal. Damaged cell membranes leak intracellular proteins into circulation and cause inflammation. Cytoplasm: The cytoplasm gives shape to the cell and holds all the organelles. Injury in cytoplasm impairs the cell's metabolic reactions, including protein synthesis. This is extremely important. Certain proteins act like "spell-checkers" and "proof-readers" and make sure there are no errors (mutations) in the nucleotide sequence before DNA replication. 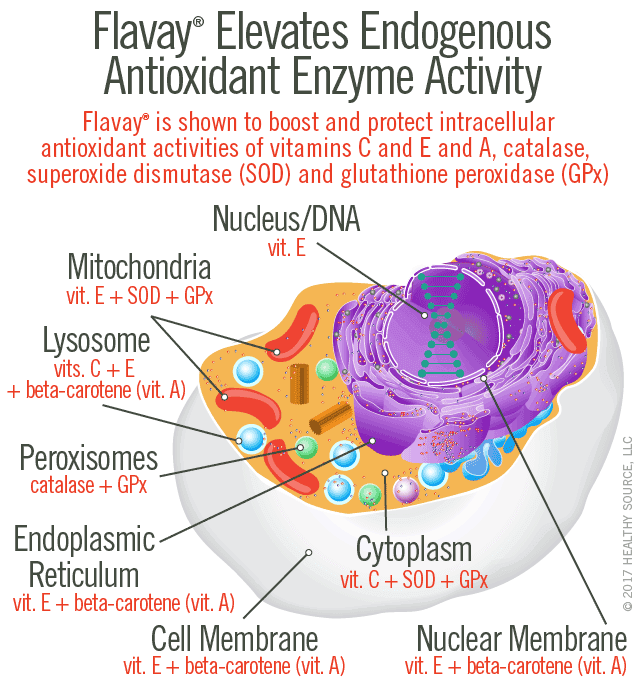 The antioxidants work as a network (synergistically) to fight free-radical damage and contribute to health and longevity. 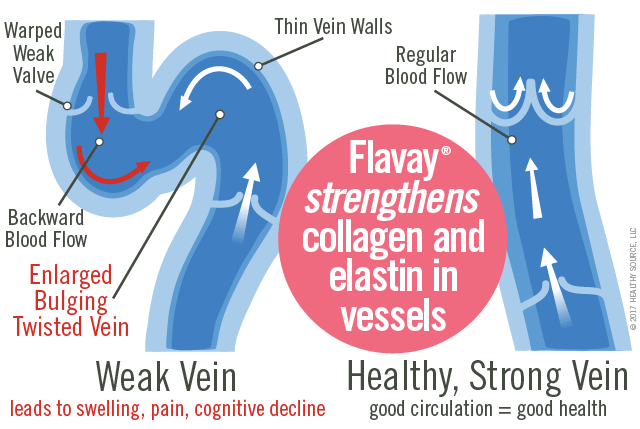 As represented in the diagram above, Flavay® has greater scavenging capacity than vitamins C or E because Flavay® has more available electrons to donate. 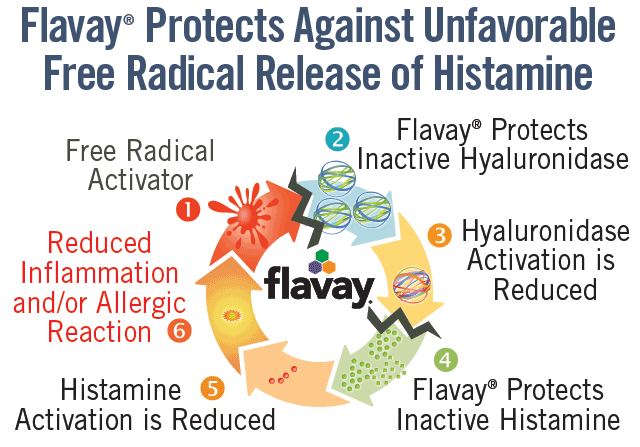 Inside the cell, Flavay® can trap eight free radicals where vitamin E can trap two and vitamin C can trap only one. 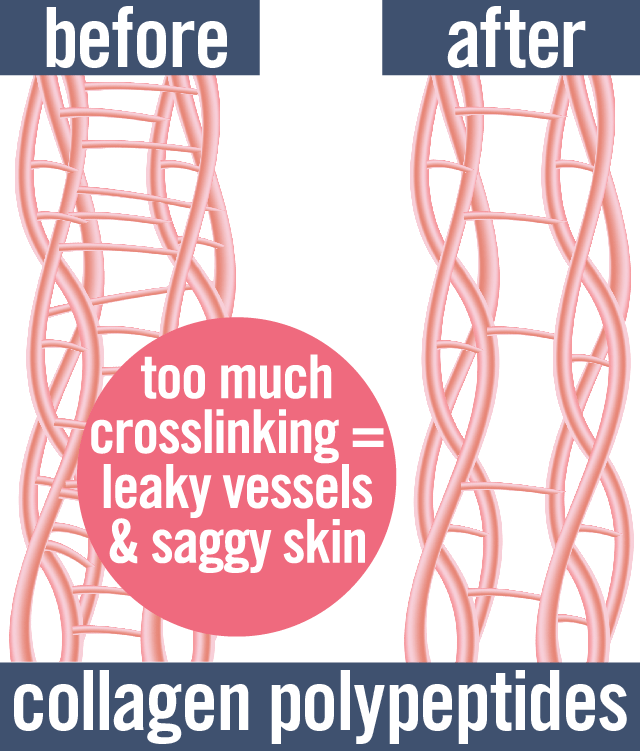 Free radicals cause crosslinking damage in collagen molecules which leads to accelerated aging, leaky vessels and saggy skin. 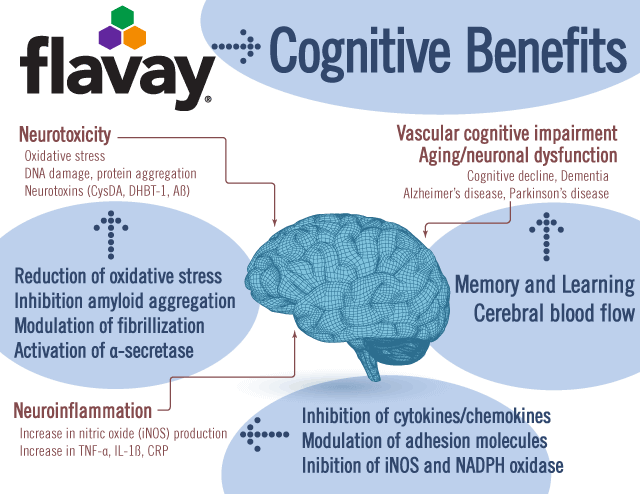 (Above:) In neurodegenerative dysfunctions, neuronal death is triggered by neurotoxicity and/or neuroinflammation and Flavay® protects cognitive function in multiple ways. 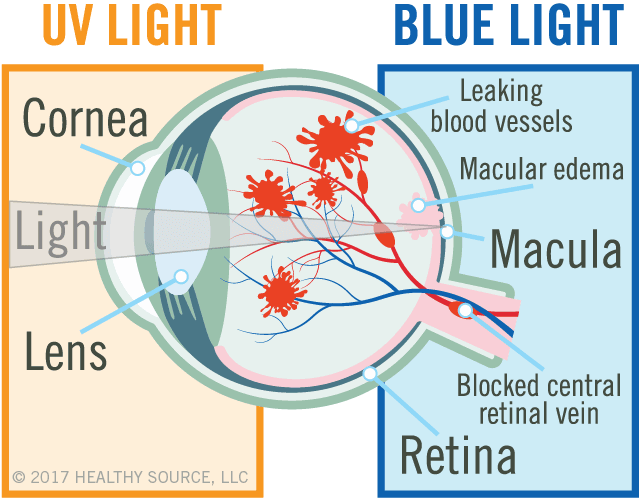 Flavay® is your best protection against "blue light" damage to your eyes. 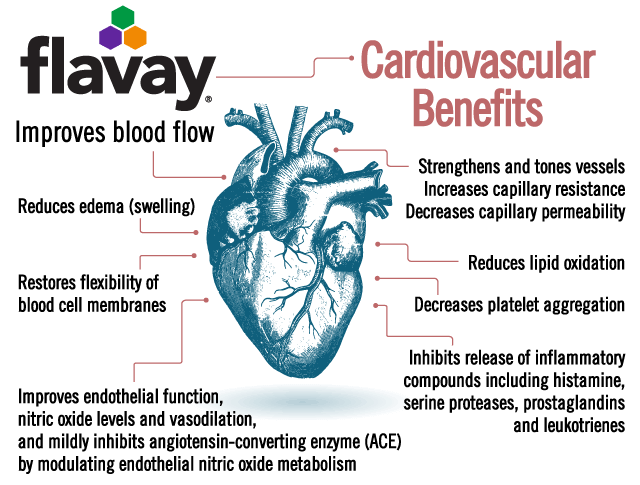 Licensed in France for for use in diabetic retinopathy, Flavay® should be part of the daily nutritional regimen of every aging person (most especially every diabetic person). 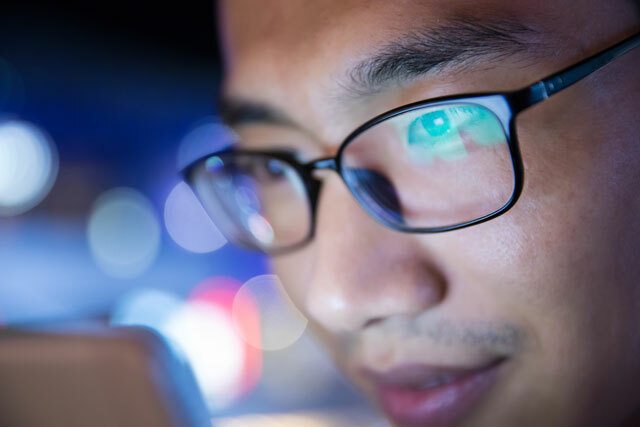 Change the way you grow older by protecting your brain cells and your vision for the many years ahead.